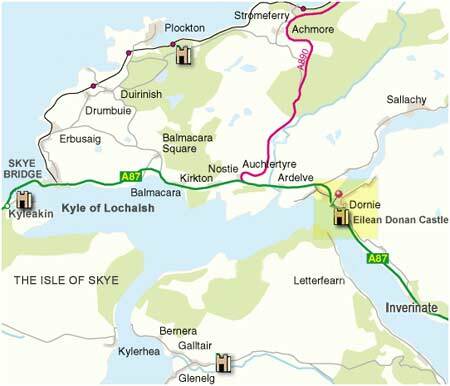 There is so much to see and do in Lochalsh and the Isle of Skye that we have arranged the site into TWO parts namely Lochalsh & The Isle of Skye. Please click the SKYE link at the top of any page when you want to find out about the Isle of Skye - or just keep reading for Lochalsh, simply the best outdoor destination in Scotland. This is the Highlands of Scotland, lands of the clans and castles, home to the salmon and the stag, hills of heather and the lochs to the sea beyond. 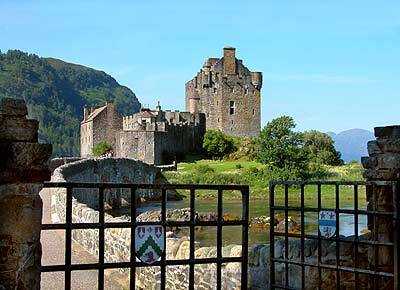 A place where the Gaelic is still spoken and the people are friendly. There are Ceilidhs with real music and food prepared fresh from the earth and sea. Where the roads, devoid of traffic wend their way through remote mountain glens to places few have seen. Lochalsh! Wild and wonderful. The postcard perfect village of Plockton. Scotland's highest waterfall, the Five Sisters of Kintail. The unsurpassed walks of Glen Shiel steeped in Jacobite history and of course the original ferry 'over the sea to Skye' from Glenelg to Kylerhea which still runs today during the summer months. The best of Scotland in one small misty isle - Skye! Bonnie Prince Charlie and Flora MacDonald, Whisky - the water of life, 500 million years of geology and the Cuillins, mountain climbing an walking, piping and the fiddle, the Gaelic University Sabhal Mòr Ostaig, watersports of all kinds, the clans and castles and of course the friendly people of this magical island.